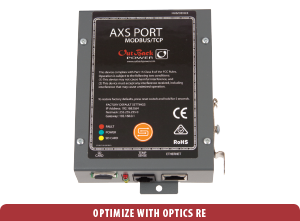 The AXS Port Modbus TCP, now OPTICS RE compatible, is a powerful and economical tool that allows installers and system owners the ability to monitor and control system status from any location. The AXS Port makes it possible to create custom user interfaces for systems using the advanced API program development kit* and download system data logs using Modbus-read or FTP transfer. All user-configurable values are backed up with non-volatile memory, ensuring stable performance and system recovery. An optional remote temperture-sensing function provides a simple, low-cost tool for capturing and reporting ambient temperture or other critical thermal information records. The AXS Port is a SunSpec compliant device**, which means it speaks the renewable energy industry's common language used to drive data and interoperability standards for plug-and-play operation between components and management systems.